Source: Produced in E. coli. Human TRAP1 (aa 60-704) is fused at the N-terminus to a His-tag. Formulation: Liquid. In 50mM TRIS, pH 7.5, containing 150mM sodium chloride, 1mM DTT, and 1mM EDTA. Scientific Background: The Hsp90 family of heat shock proteins represents one of the most abundantly expressed and highly conserved families of cellular chaperones whose expression can be upregulated under conditions of cellular stress. It includes cytoplasmic (Hsp90-alpha/beta), ER (Grp94) and mitochondrial (TRAP1) localized members. Hsp90 is structurally composed of an N-terminal ATP binding domain, a medial substrate-binding region, and a C-terminal dimerization motif. Hsp90 dimers function in cooperation with cochaperones to stabilize a multitude of client proteins substrates. TRAP1 (aka Hsp75) was originally identified as a chaperone binding partner for retinoblastoma protein. TRAP1 was later found by immunofluorescence to be localized to the mitochondria. TRAP1 is significantly more active as an ATPase due in part to the lack of regulatory elements in the C-terminus, but retains the ability to dimerize. However, it does not form stable complexes with typical cochaperones of Hsp90 like p23 and HOP4. TRAP1 has been identified as a protective element for cell survival, and has been suggested as a target for anti-cancer therapeutics. 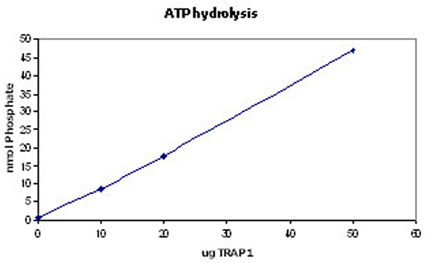 ATPase Assay: ATP hydrolysis after 1 hour at 37oC detected by malachite green. Quantities determined by comparison to potassium phosphate standard. Approximate activity is 1.2 nmol PO4/nmol TRAP1/min. Western Blot analysis: Lane 1: MWM, Lane 2: TRAP1, probed with TRAP1 mAb.